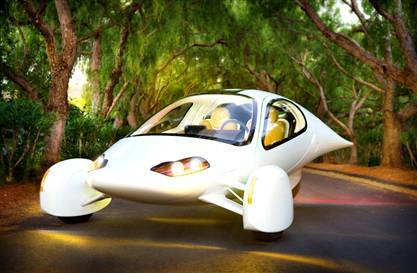 Mere Earthlings will likely do some serious rubbernecking when the Aptera Typ-1 three-wheeled vehicle hits the road, perhaps as early as this year. The vehicle, shown here, is officially classified as a motorcycle and looks more like something out of “The Jetsons” than Detroit. The California-built machine will come in all-electric and hybrid flavors, the latter getting more than 300 miles per gallon of gas. Top speed exceeds 85 mph, and the vehicle goes from 0 to 60 in under 10 seconds, the company says. About four hours plugged into a standard socket recharges a drained battery.